We have run a full suite of performance tests on the t2-micro VPS plan of Amazon EC2. Price and specifications for the t2-micro plan. The grades that summarize its performance in 5 categories based on the tests results. Links to the detailed test results that can be compared to other providers and other plans. Warning: storage costs are not included in the price above. Warning: network bandwidth costs are not included in the price above. How are the plan grades calculated? All grades are based on tests run by VpsBenchmarks on each VPS plan. There are 5 types of tests: web, sysbench, endurance, remote timings and network transfers. Each grade is the combination of one or more test metrics. 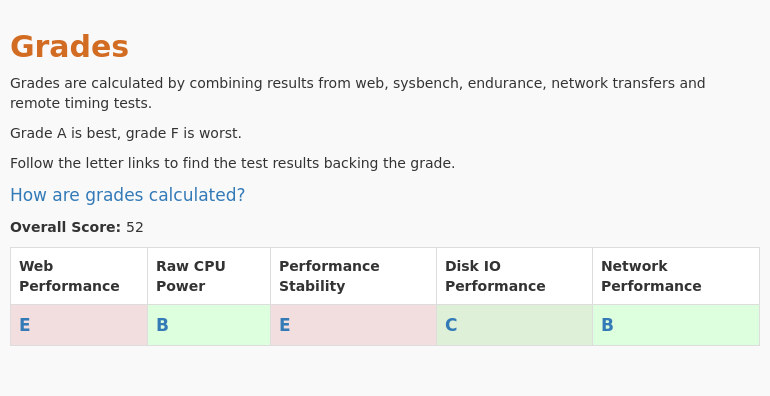 A grade is calculated in each on of 5 categories: web, cpu, disk, network and stability. Each category grade is made of one or more metrics chosen in relevant test types. Given a metric for a plan and a test, the grade for that metric is determined relative to the same metric from all other plans. A plan with a metric in the top 18% of all plans will get an A, a plan with a metric in the bottom 18% will get an F. Relevant single metric grades are then weighted and combined to give a category grade. Under the hood, a grade is a decimal number between 0.0 and 6.0. The overall score is the average of the grades in all categories brought into the [0 - 100] range. Note: The VPS plan price is not a factor in calculating the grades. More expensive plans with higher specs are likely to get higher grades than cheaper ones. This can be changed in the Screener by turning on the "price weighted" switch. The Web Performance is made of the Web test average response time and 99th percentile response time. The Raw CPU Capacity grade is made of the Sysbench CPU test number of operations per second and of the Endurance test number of iterations per hour metric. The Performance Stability grade is made of the Web test average response time standard deviation and the Endurance test number of iterations per hour standard deviation. 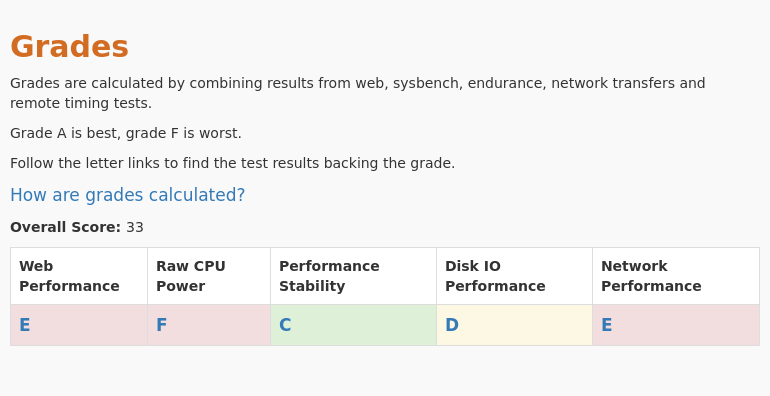 The Disk IO Performance grade is made of the Sysbench test sequential disk write speed, randow read/write speed and of the Web test database average response time. The Network Performance grade is made of web remote timimgs measured from West US, West Europe and Japan and of large file network transfer speeds. The Screener offers the option to display "price weighted" grades. With this option turned on, a low price plan that has the same performance as a high price plan will be shown with higher grades. What plans have the best value? How much performance do I get for each dollar I spend? For low price plans, the grade "bonus" is proportional to the difference between its price and $30. The function used to calculate the bonus is designed to have a small impact on very low grades and maximum impact on medium grades. Similarly, grades for high price plans are displayed lower when this option is turned on: the higher above $30 the price is, the stronger the hit on the grades. In this case, the function is designed to have very little impact on excellent grades and strong impact on medium to low grades. Grades are calculated by combining results from web, sysbench, endurance, network transfers and remote timing tests. Grade A is best, grade F is worst. Follow the letter links to find the test results backing the grade. Sysbench tests are run once at the end of each trial. They push the VPS to its limit but for a few minutes only. Remote timings are collected continuously from 4 different continents. The Web performance test lasts for the whole duration of the trial (several days) and reports the response time and system metrics of a popular website running a Ruby on Rails application backed by a Postgres database. Endurance performance tests push the VPS CPU to its limits for several hours straight and will reveal the raw power of the VPS as well as its stability over time. Network Transfers measure download and upload speed between the VPS and servers located nearby. Web performance is measured locally on the VPS and includes Rails app response times as well as system metrics. Review and compare Amazon EC2 - t2-micro web performance with other cloud providers. We ran Sysbench tests on this VPS, including CPU tests, random and sequential, read and write IO tests and memory tests. Review and compare all Sysbench numbers for the Amazon EC2 - t2-micro VPS plan. Response times for this VPS were continuously measured from 5+ locations in the world. Each measure includes DNS resolution time, connection time, TLS handshake time and server response time. Review and compare all Remote Timings numbers for the Amazon EC2 - t2-micro VPS plan. Can your VPS handle 24 hours of sustained CPU load without flinching? How much can it handle? Does the provider throttle your CPU after a while? 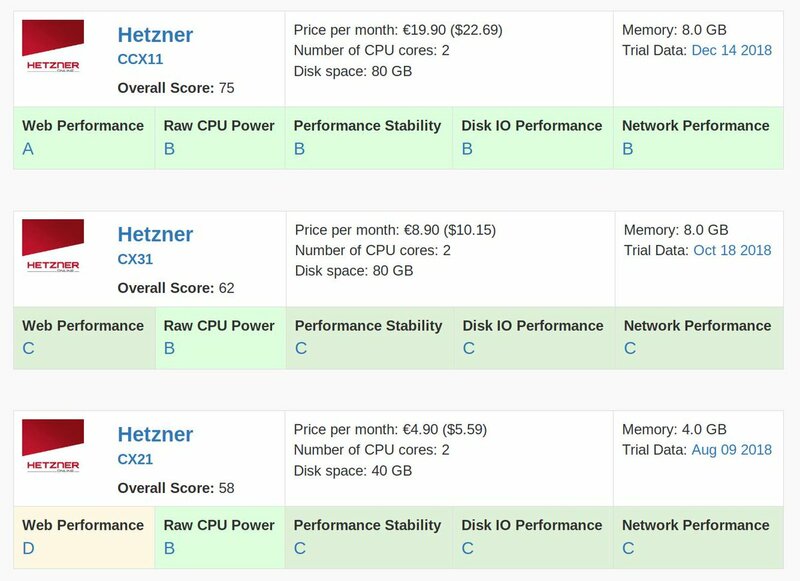 In the end only Hetzner Online GmbH Dedicated vCPU plan 2 cores 8GB 20€ performs better than its "standard" peer with the same specs but it does that for double the price. List of the best Virtual Private Servers, performance tested, that will cost you $10 or less per month. Cloud Server Providers, would you like your products to be tested at vpsbenchmarks.com? We are proud to provide objective and impartial benchmark data on this website, all VPSBenchmarks tests are conducted the same way for all Cloud providers whether or not we are affilates with them. To support us, make your hosting purchases using the Provider Affiliate Links displayed throughout the site.